Nathan P. Gilmour , 16 October 2013. When a passage in the Bible leaves us in darkness, Augustine teaches us, we should reach towards a bit of the Bible that sheds more light, and the mysterious bit we would do well to read allegorically. Closer to our own moment, theologians like Walter Brueggemann have called such moves into question, noting that our own tendency to name certain verses “light-shedding” and others as “obscure” likely reflects theological commitments prior to the revelatory text itself and thus cuts off some of the rich possibilities for interpretation that await the faithful in the Bible. One helpful move that Brueggemann suggests (and which I’ll talk about in a week or so in one of the installments of BrueggeBlog) is to assume that, when one comes across two possible and conflicting readings of a passage, or two possible and conflicting answers to a theological question, or two possible and conflicting foci with regards to the question itself; then the more difficult possibility might be the one that God wants us to take on in any given moment. Turning to the story of Jacob’s midnight wrestling match, the easy readings are not hard to come by: “struggles with God and with mortals” works very well as a psychological allegory, and for those who don’t especially like to think of Almighty God as one who can’t break out of a headlock, there’s the long tradition of referring to the figure as “an angel.” (In fact, the art I selected is unusual in the fact that Jacob is not wrestling a figure with wings.) And of course there’s the ever-popular alteration of the story by saying that Jacob’s opponent “would not” rather than “could not” overcome Jacob. All of these readings I’ve heard, and there’s no denying that there’s some appeal to each. But what strikes me on this reading is the ambiguity that the story leaves in its own terms. 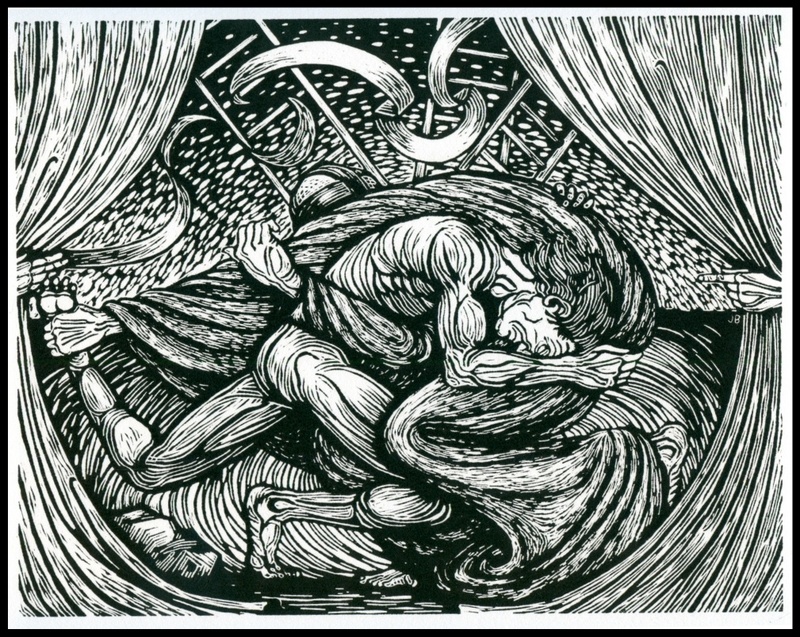 The figure with whom Jacob grapples is merely “a man” at the outset of the encounter. When Jacob demands its blessing, he asks “the man.” It’s only in the wording of the blessing that the figure becomes anything other than a man: Jacob becomes Israel, the one who has striven with men and God and prevailed. That last bit, the prevailing, is where the narrative gets especially muddy: after all, the name could very well derive from the incident that starts in 32:24, but it also must derive from some struggle with mortals (if Jacob is wrestling God) or against God (if the wrestler is mere man). Of course, the name could derive from all of the above, naming Jacob as one who has “gotten one over” on mortals (his own father and brother come to mind, as does his father-in-law) and on the divine (perhaps in his ability to dodge the destinies that usually befall such con-men). In that case, the wrestling match would indeed serve as a sort of allegorical (or typological, if you’re Reformed and get skittish around allegories) episode, something akin to the Transfiguration, where Jesus allegorically takes his place among the prophets of Israel, or perhaps to Hosea’s allegorical marriages that show the character and the “offspring” of Israel’s faithfulness. Certainly there is some distance between story and story with regards to literary modes and where the episode falls in the career of each, but ultimately there’s not much of a rule book governing how allegory is allowed to function, so that doesn’t seem to be too much of a problem. Just to make sure that we readers don’t come away from this episode too comfortable, Israel (the man and also the faithful people who tell this story in generations to come) calls the place where all of this happened “Peniel.” Once again the ambiguity is hard to deny: does the name refer very concretely to the sight of the wrestler’s face? Has Israel recognized in this moment that he has “looked into the face of God” in a more spiritual sense, perhaps in his seizing of House Abraham by means of deception and thus defying the expectations of an entirely holy deity? Or is this another one of those allegorical/typological moments, in which both are true in the same moment, though in different ways? No matter how one reads the final place-naming and the person-naming and the wrestling match itself, this story will not let us readers forget just how much life with God must always remain a life of interpretation, naming moments as God’s moments even when (perhaps especially when) their own inherent character leaves us more in darkness than in states of enlightenment. May our midnight doubts and our struggles with mortals always also be wrestling matches with God.